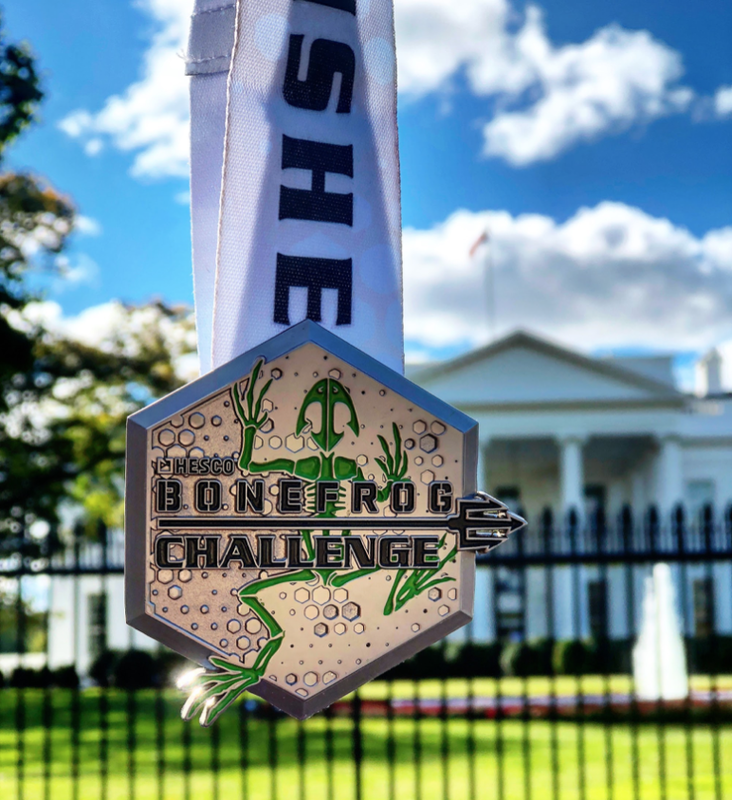 Bonefrog Challenge in Washington DC was phenomenal! 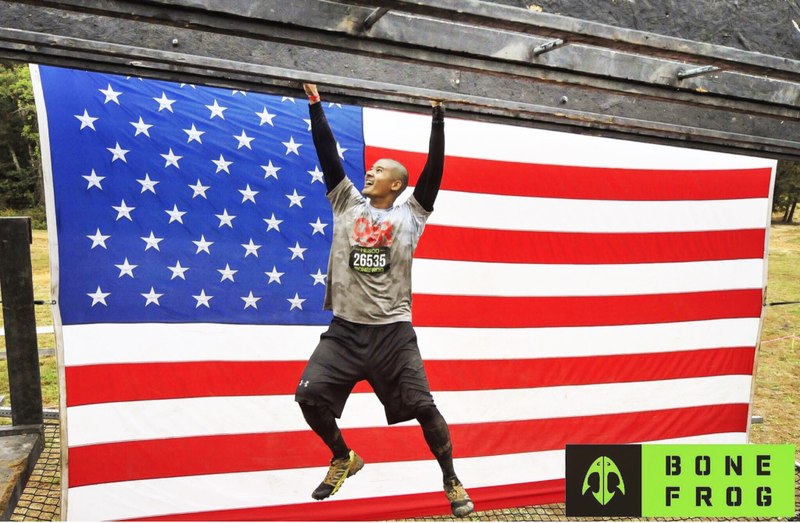 Hesco Bonefrog is a Navy Seal owned obstacle course race that challenges athletes from all over the country. This race was located outside of Washington DC and what a better place than to honor our military and enjoy one awesome obstacle race. The event was located just south of the capital at a place called Wicomico Motorsports Park. On race day it rained all morning long before the earlier heats. Which was perfect! I love racing on muddy courses but thank goodness we didn’t have to deal with the rain from start to finish. In my observation, the race didn’t have enough volunteers on the course. Maybe less showed up because of the rain on weather reports? None the less, the course consisted of 33 obstacles. With terrain running through the forest and trails. The only obstacles to worry about in beginning were the wall climbs, balance beams, and rope swings. The moderate level obstacles started on mile 3. The frog leap, Viking tables, swamp low crawls, cliffhanger & the brute force carry. At mile 4 we did dips & burpees in honor of past Navy SEAL military members they had you repeat their last names on a poster. Everyone read & repeated the names with each rep. Towards the end of the course is where all the fun intense obstacles were in place. This is also the part of the course were most of the race photographers captured the action. We took on rope climbs, dead weight carries, 180 chopper bars, ship boarding ladder climb, the tsunami wave stronghold ladder, cargo net climb & last but not least the American flag monkey bar black ops obstacle. It doesn’t get any better with the US flag as your backdrop while finishing up the race & cross that finish line with your brand new medal. There are so many great obstacles during the course! However, two obstacles really stood out to me. The first was the chopper. This obstacle you have to deal with rings & handlebars it was a true test of coordination & upper body strength. Next up would be the stronghold. In this obstacle, you grab onto monkey bars that form into a wavy pringle potato chip shape that lead you to a leveled rope strap. You continue on until you ring the bell at the end. The merchandise tent was well stocked with lots of hats, shirts, and other goods to commemorate the race. The food options included a BBQ food tent as well as protein bars, fruit bars, Gatorade & bottled water. I would have liked to see more vendors & food options next time. Overall, I enjoyed the laid back atmosphere. My niece Isabella certainly enjoyed watching her first OCR event. Soon when she’s old enough she can participate in the kids Mini Hesco Bonefrog course. She is already ready to take on the world of obstacle racing. I had an amazing time. This was my first time running the Hesco Bonefrog Challenge. I heard about the event when I lived out on the west coast. Now that I’ve relocated to the east and am expanding my range of races. This race did not disappoint. It was an honor to take part in this race. OCR industry always brings family & friends together and creates an atmosphere of teamwork & camaraderie. Thank you to the volunteers & the staff who brought this event together. Without you guys none of these fun events are possible. Can’t wait to tackle this course again next year.